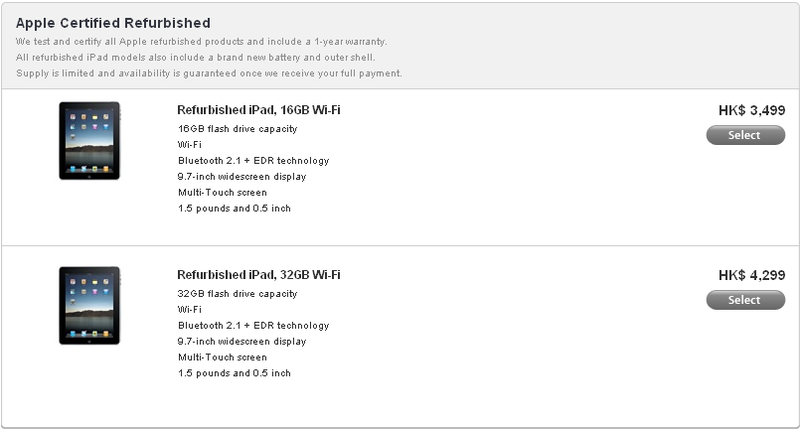 Apple finally have some refurbished iPad on the Apple Store. Prices not that great but still worth checking out. Wish they have the 3G version as well. Check out Apple Store, link here. Tickets for the 2011 Cathay Pacific/Credit Suisse Hong Kong Sevens will go on public sale on Saturday, January 22, 2011. The price of a three-day adult event ticket in 2011 will be HK$1,250, with children’s tickets priced at HK$300 for youth aged 12 and under. After an initial pre-sale period to local Rugby Clubs, HKRFU Stakeholders and official Overseas Ticketing Agents, the HKRFU will stage a public ticket sale on Saturday, January 22, 2011. The HKRFU will again use Hong Kong Ticketing to sell event tickets in 2011. More details of the public ticket sale will be released in due course. When considering tickets sold through local rugby clubs and other HKRFU stakeholders, 75% of all Sevens tickets are sold in Hong Kong. The HKRFU has confirmed that a minimum of 5,000 tickets will be made available for the local public to purchase on January 22. This includes a limited number of children’s tickets for kids aged 12 and under. To ensure the widest possible distribution of tickets individual purchases will be restricted to a maximum of two (2) per person in any combination of adult or child tickets. Overseas fans can purchase tickets through 10 appointed Official Travel Agents or Cathay Pacific, the co-title sponsor and official airline of the Cathay Pacific/Credit Suisse Hong Kong Sevens. Cathay Pacific and the Official Travel Agents offer a variety of packages including event tickets, travel and accommodation. Full contact details of these agents are available from www.hksevens.com. The Cathay Pacific/Credit Suisse Hong Kong Sevens 2011 will be held from Friday, March 25, to Sunday, March 27, 2011 at the Hong Kong Stadium. How Big is Apple’s Biggest Shopping Event of the Year? Well, we’re here and in for just ONE day special from the Apple Store. Unlike previous sales, this one actually turns out with some good deals. The BEST deals of course is with the new MacBook Air (MBA) 13-inch line. the 128GB is faring HK$9,118, down HK$770 from HK$9,888; and the 256GB version at HK$11,718, same HK$770 off. Next best deals are the iPod Touch, with discounts ranging from 9%-10.3% from the low-end 8GB to the top end 64GB version. The iMacs and MacBook Pros all slashes HK$770 from all models but with the new models on the horizon, it ain’t that attractive when compared with the MBA. As for the iPad, a straight HK$320 off for all models, and same with the iMacs and MacBook Pros, rumours indicates a release as soon as February. As for other accessories and software, hmm…. nothing much exciting unless you’re shopping for the Microsoft Office for Mac Home and Student 2011 Family Pack, was HK$1,250 and now HK$1,000, a whopping 20% off, good deal with three (3) simultaneous installations. This Friday: Apple Biggest Shopping Event of the Year. This just in from Apple. 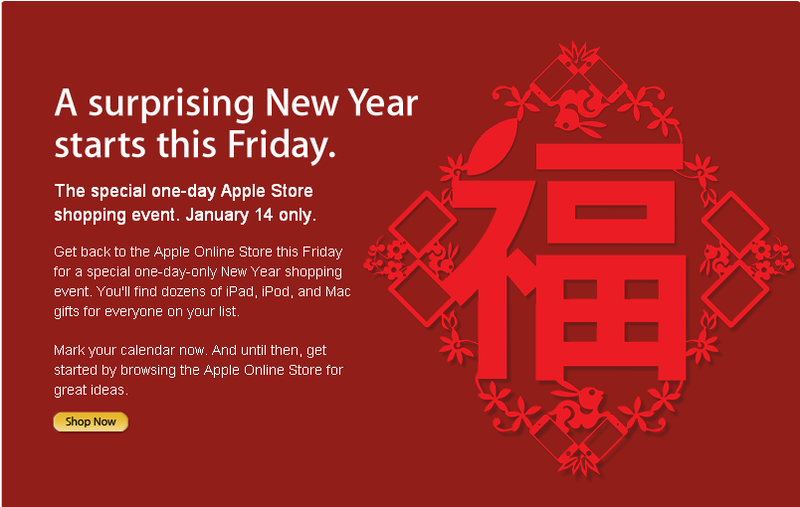 Mostly discounts for accessories, check out the Apple Chinese New Year Gift Guide Page here. Could there be more discounts for the hardware? not sure yet. Guess will find out this Friday. …. so probably Apple will announce a one-day special price on Friday. 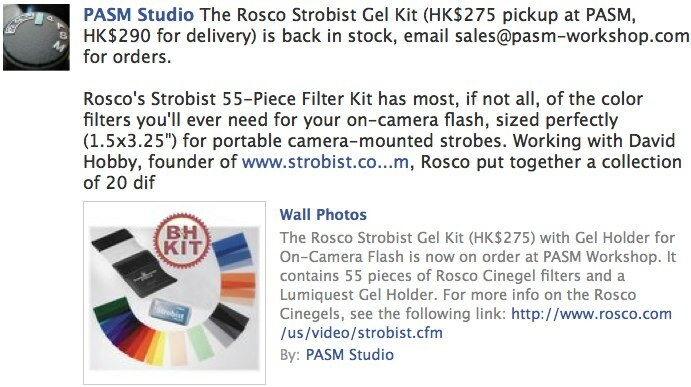 PASM Workshop is now carrying a number of photography accessories for photop enthusiast. If you want to order, send your email, contacts number and number of quantities needed to sales@pasm-workshop.com. 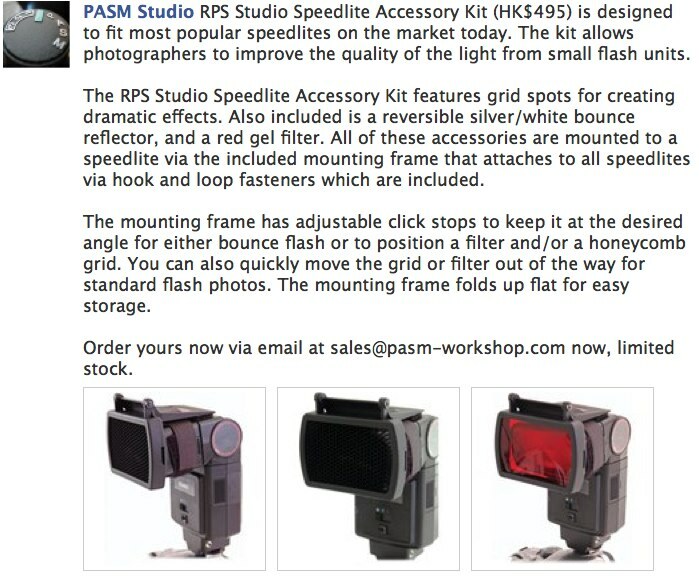 RPS Studio Speedlite Accessory Kit (HK$495) is designed to fit most popular speedlites on the market today. The kit allows photographers to improve the quality of the light from small flash units. The RPS Studio Speedlite Accessory Kit features grid spots for creating dramatic effects. Also included is a reversible silver/white bounce reflector, and a red gel filter (Additional gel filters may be purchased). All of these accessories are mounted to a speedlite via the included mounting frame that attaches to all speedlites via hook and loop fasteners which are included. 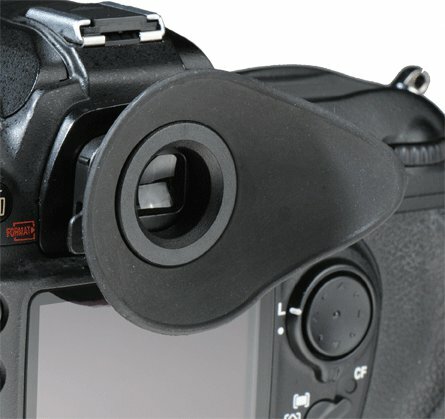 The mounting frame has adjustable click stops to keep it at the desired angle for either bounce flash or to position a filter and/or a honeycomb grid. You can also quickly move the grid or filter out of the way for standard flash photos. The mounting frame folds up flat for easy storage. Consisting of a mounting frame, three honeycomb grid spots (30°, 40°, and 50°), a silver/white reversible bounce reflector and a red filter, the Dot Line RPS Studio Speedlite Accessory Kit enables you to better control the spill rate and reflective qualities of your on-camera flash. For Glare Free LCD screen viewing… Checking your histogram, composition and focus outdoors is easy with Hoodman’s HoodLoupe. HoodLoupe is worn around your neck just like a normal loupe. When it is time to review your shot; bring Hoodloupe up to your image and place your eye up to the eye cup for complete glare free viewing. HoodLoupe has a +-3 diopter to accommodate those with less than perfect vision. HoodLoupe adjusts focus just like a binocular eye piece… you turn the eye piece in or out to set for your vision. HoodLoupe’s precise German glass optics give you a 1 to 1 ratio for true LCD screen viewing. Each HoodLoupe is encased in a user friendly rubber for comfort and protection from bumps that will occur throughout your shoot. Comfortable lanyard and compact protective storage case included. Fits up to 3.0 inch LCD screens. For more info, check out our Facebook page, http://www.facebook.com/pasm.workshop#!/pasm.workshop. If you own an iPad and want to get an Apple Magic Trackpad, I will tell you to save that US$69 as M3ME just released the awesome app, Remote Conductor (US$9.99), that turns your iPad into something more of a magical trackpad. So how does it work? According to M3ME, your iPad communicates with your Mac over Wi-Fi with a free server program called Conductor Server and the program can be installed on as many Macs you like. Once connected, you can use the Remote Conductor app as a trackpad in its track mode; an app switcher in its switcher mode; and an app launcher for all your apps on the Mac. my favourite lies with the launch mode where all apps installed (usually found in your Applications folder) are displayed in the native iPad pages view where you can flip through them the way you flip through iPad app pages andyour dock is pinned in the bottom part of the iPad screen. These are all just some of the cool features of Remote Conductor, to have a taste of what’s it like, take a look at the following video. Trust me, this is definitely the app for the year and it’s only first week of January.